Stevia Leaf is nature's sugar substitute that is said to be a safe, all-natural, zero-calorie alternative to refined sugar but is also used as an herbal supplement to regulate blood sugar levels and lower blood pressure and LDLs (bad cholesterol). People who ingest Stevia daily often report a decrease in their desire for sweets and fatty foods, which may be very helpful for dieters. Its antibacterial qualities help to promote healthy and clear skin, scalp and lustrous hair. Stevia Leaf is said to be beneficial in treating Candidiasis. Stevia as an antibacterial is useful in helping a number of skin problems, including acne, blemishes, lip and mouth sores, dermatitis and eczema. There are reports that cuts and scratches heal more rapidly after using this herb. 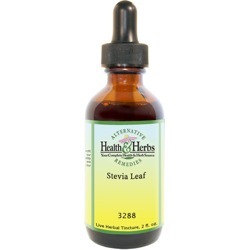 Stevia Leaf is thought to improve the quality and health of the hair and scalp. Ingredients: Stevia Leaf, Structured Water, 20% Alcohol. Non-Alcohol: Stevia Leaf, Structured Water, Vegetable Glycerin. Instructions: As a dietary supplement, use 1-4 drops in tea or water as desired. May be taken 3 times daily. Shake well. Store in cool dark place. Keep out of reach of children. Contraindications: Currently, there are no known warnings or contraindications with the use of Stevia Leaf, and it has been approved by the USFDA as safe.